Our living room looks out into the back garden, which is a great thing. It means there’s no human beings walking past to look in and be looked back at. There’s only sky and fence and a couple of trees. There’s a shed there too. You could call it a garage, I suppose, but there’s no room for a car in there, what with all the ‘stuff’ that’s piled up in it. I emptied it out once but the stuff all came back, over time. So I guess it’s just a shed now but it’s a solid one, made of concrete blocks and with a real roof on it and a window and eaves. And there’s a hole in the eaves. A pair of Blackbirds have found the hole in the eaves and squeezed their way through it and set up home inside the roof of the shed. In their comings and goings, they have made the hole bigger so now it’s pretty easy for them to get in and out. They’re like ‘Karma Chameleon’. All day long, they come and go, they come and go. I really like to watch them. Last year it was Magpies in the tall tree. The male kept coming down and fighting with his reflection in the window, which was fun for a while but got tiresome at 6.30 in the morning. The blackbirds don’t fight with the glass but they do have a penchant for flying into it. Twice, now, they've come slamming into the window and then fluttering off again, amazingly intact. Birds in other years have killed themselves by flying hard into the glass like this but these ones seems to manage only glancing blows and then they carry on regardless. At the moment, it’s all twigs and bits of moss being transported into the shed. I suppose that means there’s no eggs yet but I’m no David Attenborough, despite the title of the piece. I’m hopeful that, soon, there’ll be worms and grubs on the transport into the roof space and, some time after that, a fledgling’s head peeping out of the gap. There is some pleasure in the prospect of that. But there is a cloud on the horizon. The Crows have now found the gap in the eaves too. They have pecked and worried at it and made it more their size and then they have heaved themselves inside while the Blackbirds sit on the ridge and revile them fruitlessly. The Crows take their own sweet time inside and, when they come out, their beaks are primed with the hard-gained material of the Blackbirds’ nest. Once or twice, a Blackbird had tried to fend them off from within but the Crows are tenacious, hanging upside-down outside the eaves gap by their claws and fighting back with effortless force. When they are finally gone, the residents get collecting again, rebuilding their nest with a foolish optimism that reminds me a bit of myself. I haven’t seen the Crows visit the gap in over a day now. The hope is that they have got what they wanted and will now leave the blackbirds alone to roost in peace. But that’s rather a vain hope, I reckon. My worry is that the Crows have now marked the place as one which can provide a morbid feast in the weeks to come and that, with inherent calculation, they will return when the hard work is done and the chicks are fattened and then, alas, they may sup. I watch and hope with fascination. I could go out and try to scare the crows away, when they return, but then don’t I risk scaring the Blackbirds off too? I think I’ll have to let it play out and I sense the inevitability of it all. 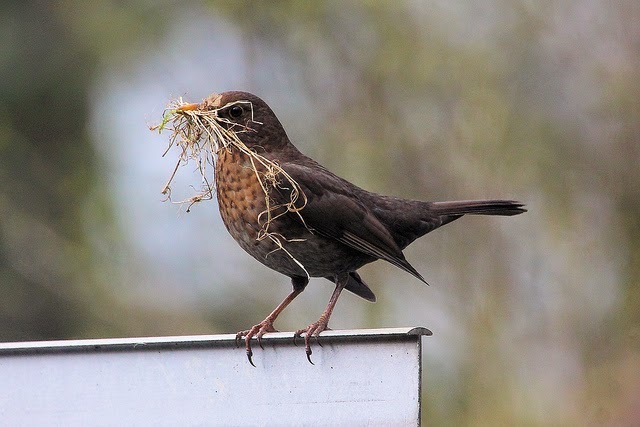 Still, life continues to prevail somehow, against considerable odds so perhaps the Blackbirds will see their Springtime endeavour out to a successful conclusion. My mother was like you. She spent hours watching the comings and goings in her back garden. No one ever took much interest in the front garden. We weeded it and Dad trimmed the privets but that was it. When he died all that fell to me but luckily he’d replaced the privets with a wall by then so I had only the ones in the back garden to concern myself with. I hated all of it. I’ve said before but when Carrie was looking for flats for us I had only two preconditions: an office for each of us and no garden. Of course technically there is a garden but it’s not my responsibility. I only ever venture into it to put out the rubbish. I never sunbathe or take a folding chair out to read. And as the blinds in my office are permanently closed I never take any interest in what might be happening or not happening out there. The only window on nature I have is the small side window in the living room. It looks out onto the park beside us and I do use the term ‘park’ loosely but I have seen a couple of deer there which was nice and unexpected and I’m sure I’ll’ve seen a fox or two but apart from birds mostly it’s just squirrels. I did find a dirty great toad once in the back garden and rushed upstairs to show Carrie (you’d think I was six or something) and mice’ve visited us a couple of times which we both delighted in—brazen wee buggers they were—and then went out and bought some humane traps. The only bird in our life is Birdie and he’s more than enough. Since he keeps time with us he’s never awake at 6:30. His curtain goes up around 9:30 usually and even then he’ll refuse to get off his stick and sit there for a half hour pulling himself together. He’s an odd bird, a combination between a grumpy old man, a tantrumy toddler and Sid the snake (he hisses when he’s annoyed). He used to fly into the window too. To stop him Carrie hung eight or nice strings from a bar and that’s enough for him to register it as a solid object.